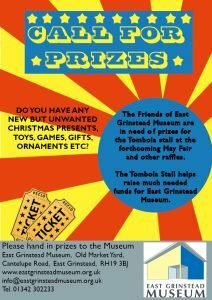 After the success of or tombola stall at the Christmas Fair, our stock of prizes is sadly depleted! Do you have any unwanted Christmas presents which you can donate to us? If so, please leave at the Museum for the attention of Jennie Hollins.